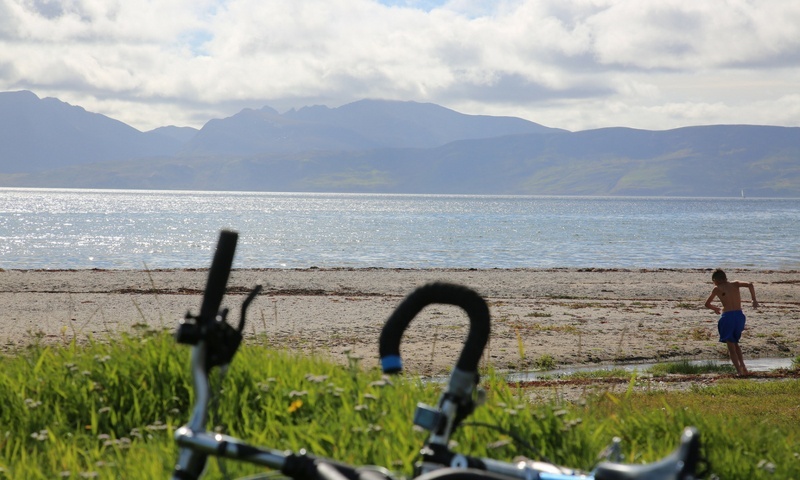 Here’s the second in a series of blogs from playwright Lewis Hetherington about his work with Glasgow cycling charity Bike for Good and Creative Carbon Scotland. 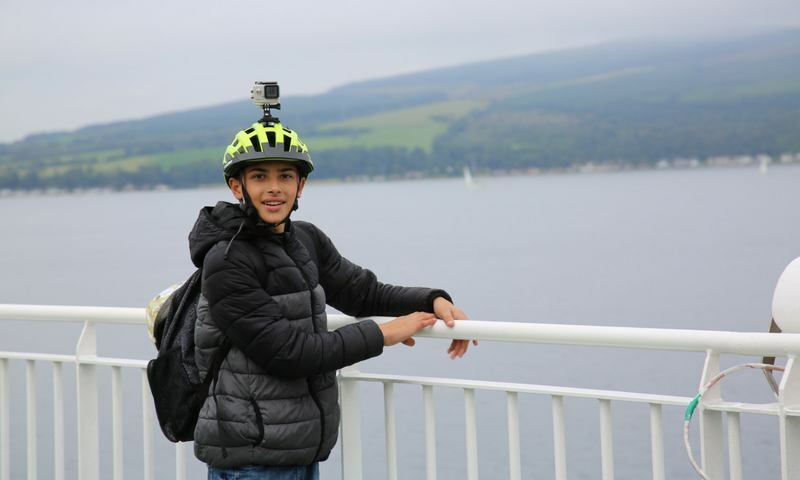 Lewis is working embedded with Bike for Good for two years to document their VeloCommunities project and contribute to their activities widening access to cycling and helping Glasgow to become a more sustainable city. In my first blog I leant into the idea of cycling as a path to joy, freedom and empowerment. Nothing could have captured these ideas better than the recent trip I was lucky enough to go on with the Bike for Good team and some of the brilliant young people who come along to the after-school clubs. 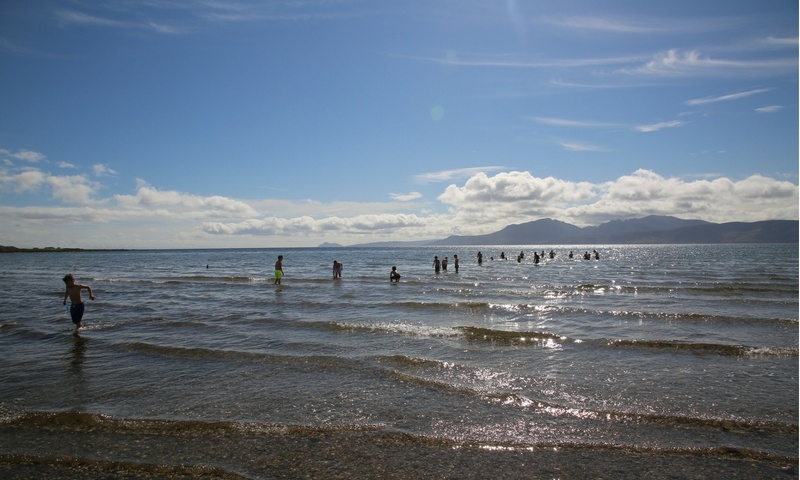 We went to Bute, we cycled, we ate chips, we laughed. We had one day out of life. Joining me for the ride was the fantastic, inimitable and mega filmmaker Geraldine Heaney so we could start to introduce the filmmaking component of the project to the group. From the moment we all gathered at Queen’s Park station, with some of our number about to ride on a train for the first time, we could tell that this would be a day to remember. We all piled in, the excitement at fever pitch even though we were still only minutes away from our own front doors. We swapped trains at Central station and headed out to Wemyss Bay and from there onto the ferry. There was sweets, hot chocolate and more excitement. We saw dolphins playing in the water, a fitting salute to our arrival. Bute was enshrouded in mist, but even that couldn’t mute us as we pushed the bikes out from the car deck and got ready for our cycle. All the while I’m thinking, “This is so easy. Why are we all not leaping on the ferry to Bute whenever we get the chance?”. But then here I am now, two weeks later, and I’ve not been back. That said I am in the park with the dogs four times a day, and the trip reminded me what a privilege and a pleasure it is to get out into green space. What I am trying to say is that as we all took in the sea air and the rolling hills I thought “If this is planting seeds in these young folks of a sense of connection to the outdoors, then something is going right”. We cycled across the island and just as in all the best life-affirming buddy movies the sun suddenly burst through the clouds and we were drenched in light. We arrived at our destination, a beach with white sands stretching out and turquoise waters rippling. So of course we all went for a swim. …followed by lunch, football, gymnastics and more. It was a pretty special day. As I said, Geraldine had brought her camera along, as well as having bought a brand new GoPro for the occasion. 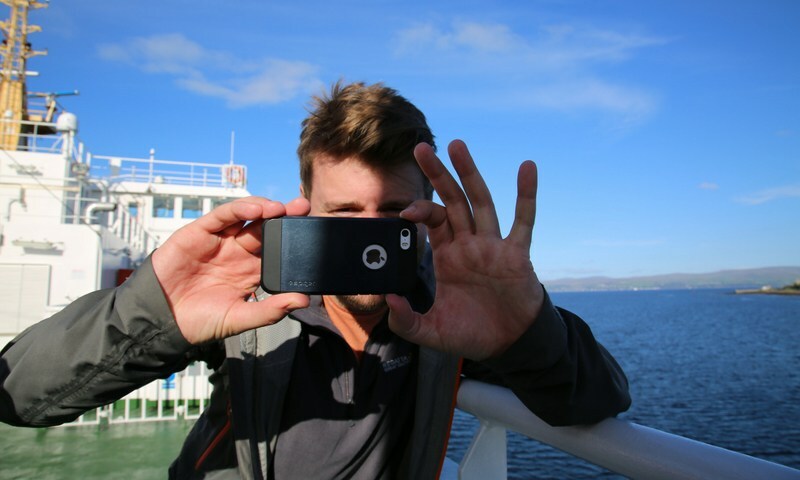 Geraldine and C assembled the new camera on the train out, so C got to attach it to his helmet and collect footage from the moment we arrived on Bute. T was so enthusiastic about taking photos we were worried that he’d use up all the memory space and battery life just taking pictures of the inside of the train carriage. 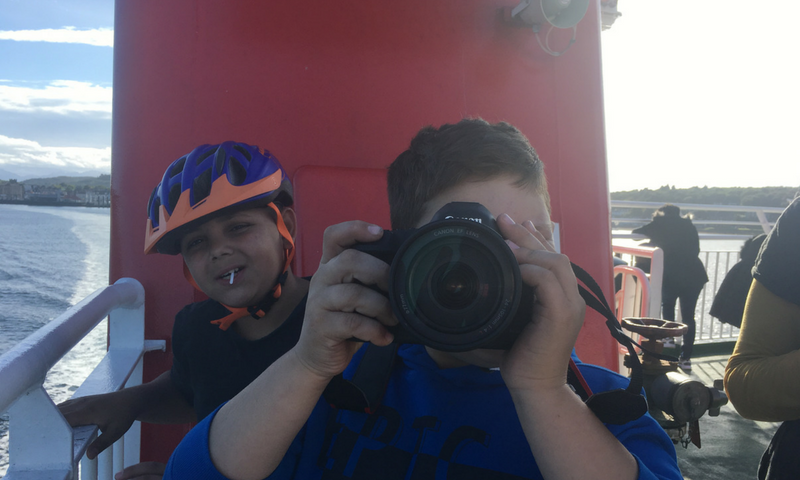 Thankfully however there were plenty of photos taken on the island which you’re seeing through this blog taken by either Geraldine or the young people. They really embraced the idea that they should choose where to shoot, what to focus on, where to direct our lens and our interrogation. The next stage will be to build their skills and interest with the cameras and also microphones so we can start to capture interviews and interactions. To find ways to have those conversations about climate change, without people feeling despondent, or glazing over. To find ways for the young people to lead that dialogue on how we manage what is arguably the biggest crisis (in a crowded field) of our time. And that’s the nub of it really – how do we join the dots between what is now and what might become? In the last few weeks stories continue to roll in about the increasing frequency of extreme weather events and the damage they are doing, and I find myself wondering how we make a bridge between the joy of cycling and the terror of our potential futures if we don’t get things sorted. How do we sustain both these ideas? What can we do? We need ways to embrace hard truths but also never lose joy and hope. How can it be fair to ask these children who live so happily in the present to take on the environmental mess we’ve made for them? All these things keep swirling in my mind as we roll back through Rothesay on our bikes and then onto the ferry. The mood is still buzzy but a little more contemplative as we scan the horizon. None of us know what’s to come. But in that moment on the boat, the weather is calm, and we are together – we shared an experience. As I feel the sun on my face I allow myself to lean into the present and this happy moment I find myself in, and let that recharge me for the work to come. This artist in residence is part of Bike for Good’s VeloCommunities Project, which is funded by the Scottish Government’s Climate Challenge Fund. We’ll keep you posted of updates and developments on this bi-monthly blog, and please get in touch with any questions or ideas!